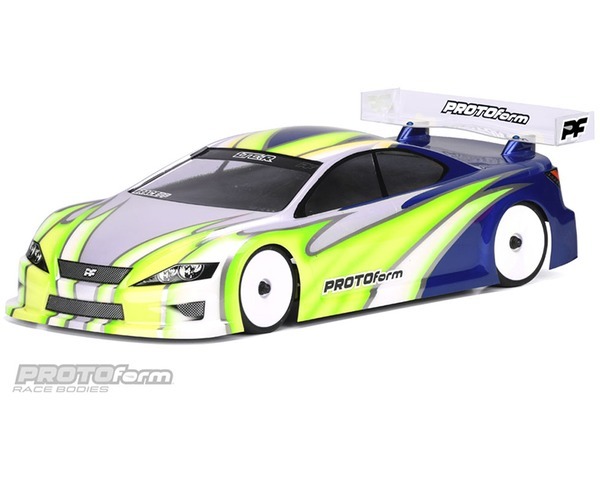 This Global Body Spec-ready race body is designed specifically for these lower-grip applications, with slightly more steering ability than the all conquering PROTOform Mazdaspeed6 body style, yet less aggressive than the PROTOform R9-R body. To further aid balance and rear grip, the wing mounting location is moved slightly rearward. The LTC-R features two trim lines - one for IFMAR/EFRA/ROAR/JMCRA racing at the 115mm height as well as the BRCAs 120mm height rule. The oversized rear wing helps performance on a poor-grip surface thats commonly experienced in clube racing, but also incorporates trim lines for sanctioned style racing. All bodies are sold in crystal clear lexan and are painted for advertising purposes only.